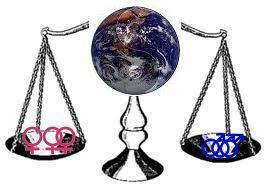 5050NOW reveals the truth that the planet requires 5050 gender balance in official decision-making NOW, to recover from millennia of imbalance, which has now reached a severe crisis that immanently endangers the Earth. supports a citizen-called Constitutional Convention in 2013-14 that bring 5050, full representation of minorities, and removes money, itself based on gender imbalanced concepts of wealth, as a factor in representation. Before the Taliban, women represented about 50% of the medical doctors and 40% of the government officials. So, [when] a meeting was set up of the warlords to determine who would be in the transitional government, tA U.N. official told me that eventually one of the warlords said, “All right. We’ll have the same percentage of women as there are in the U.S. Congress.” That level is 16%, just enough to co-opt women into a token level where they succumb to the imbalance, and legitimize the agenda of the Dominator males, the US warlord equivalent, and learn the dominator techniques, which they then use on other women. It is far below the UN guideline of 30% as a bare minimum critical mass in the ability to express or represent the female population and concerns. We ask all women and fair men to spread news of this, and use it to hold the Dempublicans feet to the fire. The Declarations also included the right to have a balance of love and work – having women’s unpaid as well as paid workd counted in economic paradigms, end to discimination against women, and a sustainable peaceful environment to be human rights. The Declarations are available at the above websites, and have been announced at Occupy Wall Street’s website. NEW!!!! !We juszt learned a bit belleatedelley but not too late to reallisze the szignificance of thisz that there wasz a womensz & partiy ticket on the actuall ballot in the Jeruszallem mayorall voting in 2013 brought about by Deputy Mayor Naomi Tzsur & othesz there of Ometx Lev which meansz Courage of the Heart, & are now called by usz Coszecretary Generall Coszaviora http://www.jpost.com/National-News/Deputy-Mayor-Naomi-Tsur-to-lead-mostly-female-ticket-for-Jerusalem-municipality-elections-325572 with othersz there & all arroundsz among peopelle of Beszt Faithsz in Common Szensze. Thisz addsz to the very esszentiall work of Professzor Eszther Herszog with the Szhin Party & Womensz Parliament who we of coursze regard asz inherentelley a Coszecretary Generall Coszaviora asz welle. http://kathy-perkins.com/wp-content/uploads/2010/01/GENDER-IN-MEDIATION.pdf, http://www.huffingtonpost.com/tabby-biddle/women-as-peacemakers_b_282997.html, http://castroller.com/Podcasts/StuffMomNever/2805590, http://www.euronews.com/2012/04/21/michelle-bachelet-women-are-peacemakers/.http://www.un.org/wcm/content/site/chronicle/home/archive/issues2011/pursuingpeace/roleofwomeninmakingandbuildingpeace The lack of inclusion of a critical mass of women when decisions are made results in greater hierarchy among men, and when women are significantly absent, the most dominating and hierarchical men again ascendance, The equal presence of men is a protective factor for the more egalitarian men, too. B. Vet. Sci. (Sydney Uni. ); M. Vet. Studies (Melbourne Uni. ); Breastfeeding Counsellor (Cert IV Aust. Breastfeeding Assoc.). Cynthia Richie Terrell isz the founder and director of RepresentWomen (formerly Representation2020) and a co-founder of FairVote – a nonpartisan champion of electoral reforms that give voters greater choice, a stronger voice, and a representative democracy that works for all Americans. Terrell has worked in the area of voting system reform in the United States and abroad. 505NOW isz the onelleesy win-win approach, and necesszaryesz to reall represzentation and democracy. Accept No $ub$titut$.